We actually visited Mt. Rushmore twice while we were in the Black Hills. We were very distracted on our first trip for a number of reasons. First, we had just found out that our Volvo engine needed replaced (which ultimately led us to scrap the car entirely). But, ironically, that wasn’t what most lowered our spirits. Upon our arrival at the sculpture, I pulled our Olympus Pen camera from the backpack to take a picture and realized we had cracked its LCD screen – which is the only viewpoint of the camera and is required to change settings, focus, view pictures… pretty much anything. With all these follies on the first trip, we decided to make a second trip with a new camera and rental vehicle. This visit, we took our time and truly appreciated the beauty of the creation. This masterpiece is one that could be admired for hours. We marveled at its size and precision, and the meaning behind it. The most spectacular fact about Mt. 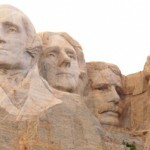 Rushmore is that it was completed in 17 years for $1 million dollars. Originally it was designed as a full-body portrait including the presidents’ chests (as you can see from Lincoln’s jacket collar.) Time constraints and budget overruns forced the artist to scrap his original plans. The memorial is meant to remember specifically the Louisiana purchase and westward expansion, but also the men themselves, heroes and role models for our democratic way of life. It’s truly an amazing piece of art and something of which Americans can be quite proud. The Mountain was named after Charles E. Rushmore, a prominent New York lawyer who led an expedition in 1885. Construction began on October 4, 1927 and finalized the 60 foot tall faces on October 31, 1941. No workers died during the construction of this sculpture despite using only the crudest of tools and working from sling baskets up to 12 hours a day.